Electricity can be one of the greenest power sources, because it can be generated from the natural energy of wind, sun or running water. Unfortunately, the vast majority of Britain's electricity still comes from burning fossil fuels like coal, oil and gas, and that is the biggest single contributor to global warming in the country, responsible for 30 per cent of carbon dioxide emissions. Only a quarter of UK electricity production comes from carbon-free sources such as nuclear and renewables, while green electricity accounts for just four per cent. Changes are afoot, however. The Government's Renewables Obligation requires electricity suppliers to provide an increasing proportion of green electricity, and most suppliers now offer a green tariff. People have the power to choose who supplies the electricity to their homes and how it is generated, no matter where they live in the country, and this is likely to be the biggest force behind an upturn in green energy and a step towards protecting the environment. Different suppliers have different ideas of what constitutes green electricity. Harnessing the power of the wind, the sun and water is pollution free, but other sources such as sewage, landfill gas and biomass usually involve some form of burning and have some associated environmental impact, albeit significantly less than conventional sources. There are pros and cons for some of the 'green' sources. For example, decomposing rubbish in landfill sites gives off methane gas and burning this gas can generate electricity. The burning process gives off harmful carbon dioxide, but the methane from the landfill site is an even more powerful greenhouse gas and so it can be argued it is better to burn the methane than allow it into the atmosphere. How suppliers view these 'green' sources and how they charge for environmentally friendly electricity, which is typically a bit more expensive, varies. One supplier claims its average customer can reduce carbon dioxide emissions by two tonnes every year - the equivalent of travelling 5,000 miles in a petrol car - and cut their household's carbon dioxide emissions by a third. That's because the supplier sources all of its electricity from renewable sources, so for every unit used by customers, an equivalent unit from a renewable source is supplied it to the national grid. Another supplier has been building wind turbines and selling electricity throughout the UK since 1996. It has two tariffs, one of which is a 100 per cent green supply tariff. Overall, more than 24 per cent of the electricity it supplies is from renewable sources and that's six times the national average. In addition, the supplier planted a tree for each of its first 20,000 customers and the result is new woodland at Lynch Knoll, Gloucestershire. 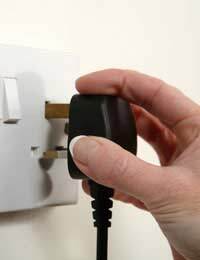 One of the UK's major suppliers has a green tariff that comes at a price. A small, monthly payment is made to a non-profit fund that invests in developing renewable energy sources and technologies. The fund also helps schools reduce carbon dioxide emissions and educates children on energy and environmental issues. Another supplier with a green fund charges its customers an extra amount per unit of electricity used on its green tariff. It matches that amount and pays the whole lot to its green fund, which supports renewable energy projects. Green tariff customers also receive a home energy survey, an energy efficiency guide and two energy-saving light bulbs. With the Government exerting pressure on suppliers to source more electricity from renewable sources and customers becoming more aware of environmental issues, the market for green electricity is likely to grow and demand should drive prices down.